You end up in this dry, slow stage desperately trying to get out. I’ve been there as I’m sure a lot of you know. I went travelling for a while and when I came back I had no clients. I went straight into panic mode, because I didn't have any savings either. But social media helped me get booked out for a solid six months. 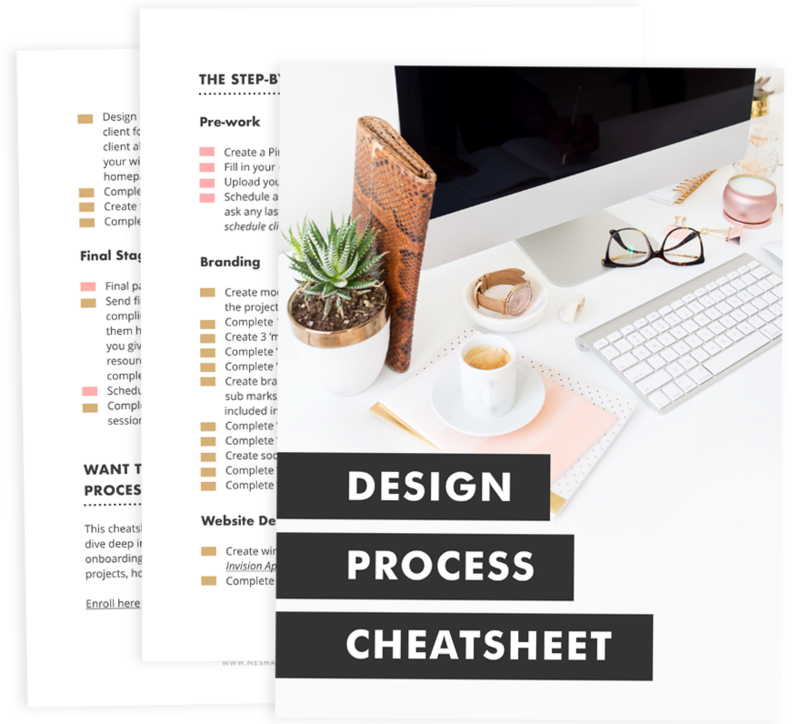 Getting clients from social media can seem really vague and a little daunting, especially when the best you’ve been able to do until now is attract OTHER designers on Instagram and get a few clicks from Facebook to your blog posts. But if done right, it’s better than sitting around relying on OTHER PEOPLE to send work your way. That’s not a safe strategy to rest your financial security on. The first step in finding clients on social media is finding a platform that will work best for you. I personally think Facebook groups are the best because I’ve found a lot of my clients there. When I did my first ‘big’ price boost so my packages ranged from $1500 - $4000, Facebook groups were the place I found clients for those packages. How can I get my voice heard in a Facebook group with thousands of people? How can I promote my design services when there’s a no-promo rule? How do I even find the right Facebook groups? You should be able to remember the names and occupations of at least five people from each group. If you can’t, you need to spend more time in your chosen groups or cut down to 1 or 2 groups. The trick to getting clients from Facebook groups isn’t about getting in front of thousands of people. It’s about getting in front of fewer people, focusing on them, and really getting to know them and letting them get to know you. You’ve probably heard entrepreneurs say it’s more beneficial to have a small email list with a higher level of engagement than a huge list with little engagement, right? The same principle applies to Facebook groups. The quality of your interaction is more important than the quantity of groups you’re a part of. You’ll find it easier to have a high quality interaction in groups if you only focus on 3 groups. So I want you to choose 3 groups to really invest your time in. I made a free download for you! It’s a list of 20 Facebook groups where you can find potential brand & web design clients. I recommend choosing 2 groups of ideal clients and 1 group of other designers. It’s important to connect with other designers because they will send work your way. If you use this strategy, you’re never putting all of your eggs in one basket. You’re not relying solely on referrals or solely on social media marketing, you’re mixing it up. If your target client isn’t female entrepreneurs, I want you to open Facebook and open a group you’re already a part of. Down the right side, you’ll see related groups. Join a couple of new groups from there! I like this rule because it keeps groups from getting spammy. You don’t need to keep posting links to your site to get clients. It will do the opposite, it will put people off from hiring you. Instead, you have to give of your expertise and connect with people every day. Don’t think of the members as potential money, think of them as real people who need your help. Every day, spend 30 minutes commenting on the posts that are asking for design advice. Ask if you can send a personal message to someone to help them further. Or give them your email address. Do this for a month and you’ll start to become the go-to designer in the 3 groups you chose. When people from that group need a designer, you'll come to mind first. You’ll even come to the group owners mind! When you start your own Facebook group, you’re gathering your most loyal community members in one online space. It’s a space where you can interact with them, build relationships with them, find out what they need from you and turn them from potential clients to paying clients. Who are they going to hire as their designer when they need one? The designer they saw a few times around Pinterest or the designer they know, like, trust and interact with every day on Facebook? Just beware. Facebook groups are hard work, so know your WHY before doing it. Don’t create a group with the purpose to gather other designers - do it to gather clients. Give your group a subject that is design related not biz related. Maybe it’s a group for entrepreneurs who need branding help? Or a group for Wordpress website owners? Remember I made a free download for you! It’s a list of 20 Facebook groups where you can find potential brand & web design clients.